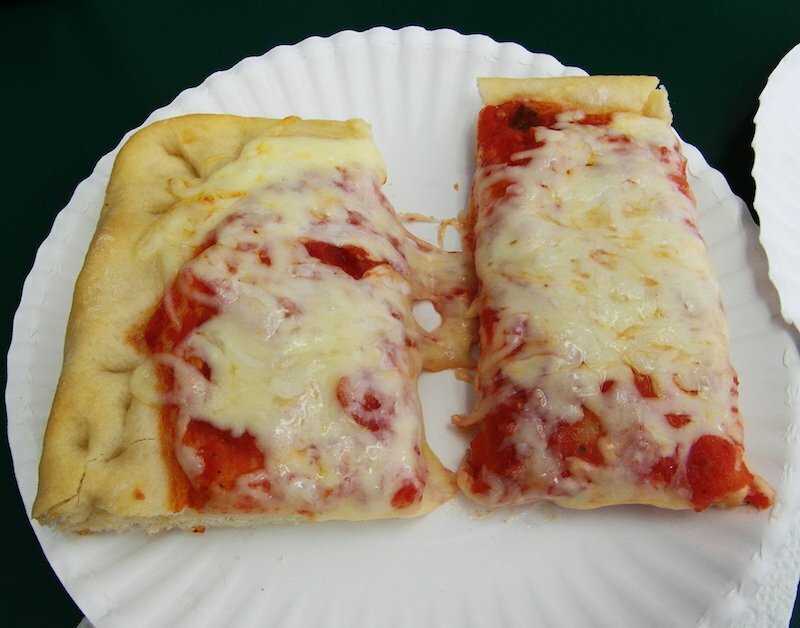 Review of Old Forge pizza: Is it the pizza capital of the world? When we think of places for the best pizza in the world our thoughts normally drift to New York or Italy. But the town of Old Forge, Pennsylvania claims that it is the “Pizza Capital of the World.” Those are pretty big words for such a small town. 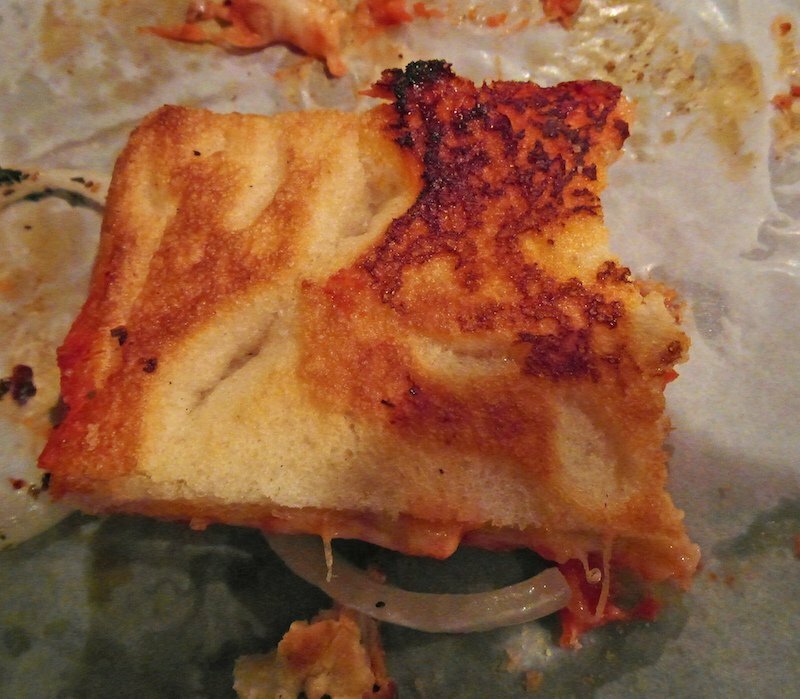 We just had to check this out so here is our review of Old Forge pizza. Old Forge is in northeast Pennsylvania (known to locals as NEPA), only five miles from Scranton of the TV show The Office fame. 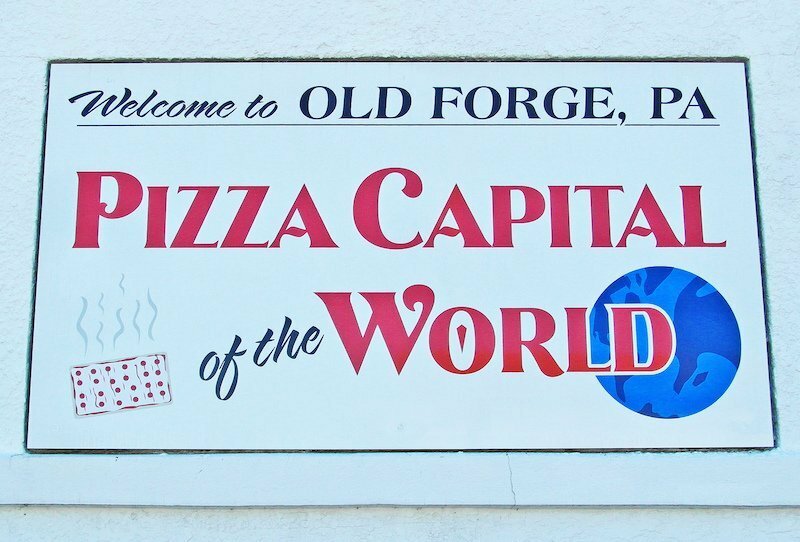 With a population of only around 8,000 supporting 14 pizzerias, it may well be the “Pizza per Capita” capital of the world, but “Pizza Capital?” So off to Old Forge we went to see, and taste, for ourselves. 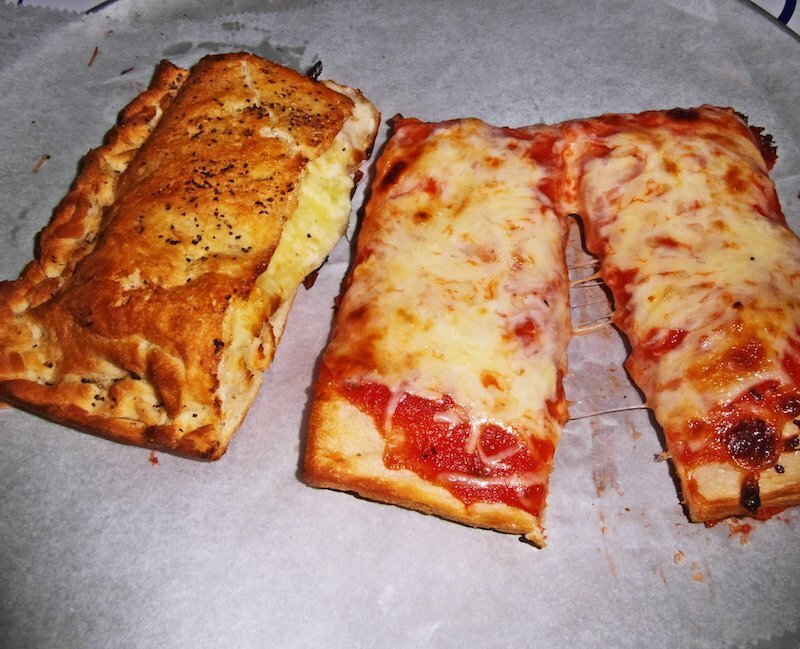 Old Forge-style pizza is baked in rectangular metal trays. It’s distinguished by the blend of cheeses, they vary at each establishment, that can be a combination of mozzarella, parmesan, romano, American and … what? Did they just say American? This we had to check out. So follow along as we push ourselves to taste Old Forge pizza at four places in one day. 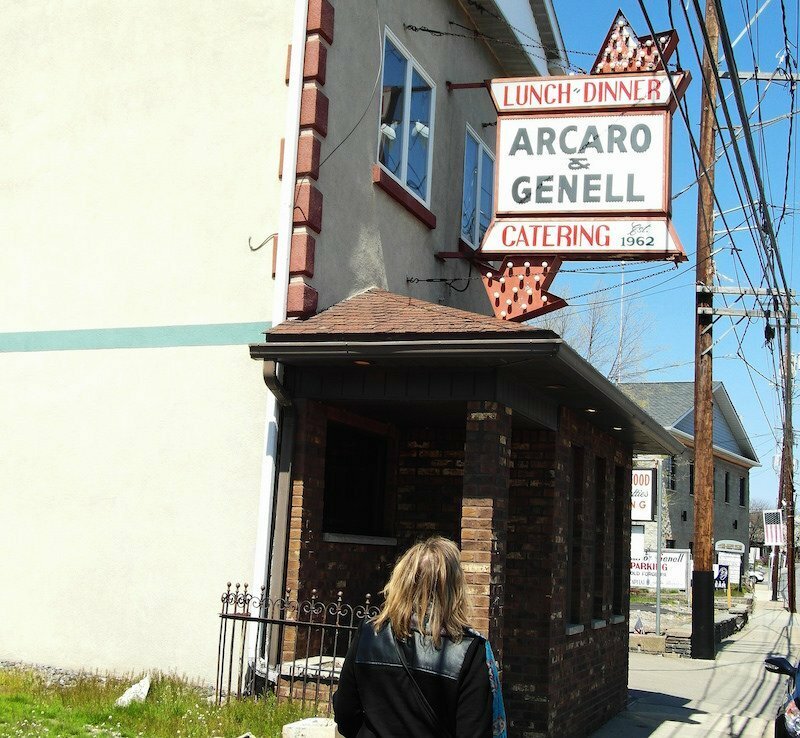 We started our pilgrimage at Arcaro & Genell. Settled into puffy vinyl booths, with Frank Sinatra playing on the radio, we felt like we had appeared in the 1950s-era restaurant from the movie Big Night. Since we were newbies, the cheerful Amanda was our guide to the ways of Old Forge-style pizza. A whole pizza is not called a pie but a tray, and individual slices are called cuts. It comes in traditional red and a white. The white pizza at most places is actually a double crust pizza made by folding the dough over the topping. Are you with me so far? We selected the classic red pizza with original crust (not the thinner variation) and a single crust white topped with fresh tomato, garlic and onion. Arcaro’s proudly proclaims that they were selected as a Top 10 pizza in America. The rating was done by USA TODAY back in 1983 but it’s still pretty impressive. The sauce on the red tray had the classic Old Forge taste, a bit oniony and a bit sweet. The pans are brushed with olive oil, making the crust crispy on the bottom rising to a chewiness directly beneath the sauce. The cheese was a blend that we guessed was Mozzarella, American and Cheddar; but Amanda would not reveal state secrets. The single-crust white was garnished with fresh tomatoes, raw onions, and a pesto type blend of minced garlic and dried basil. Both pizzas met with our immediate approval. The cheese blend is not traditional, but seemed to work. 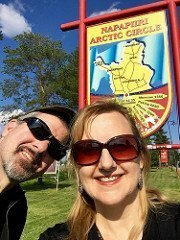 Thinking of the day ahead, we tried not to fill up and walked across the street to Revello’s. You know you’re in Northeast Pennsylvania when the pizzerias also offer pierogies, a staple in these Polish and Italian former mining towns. 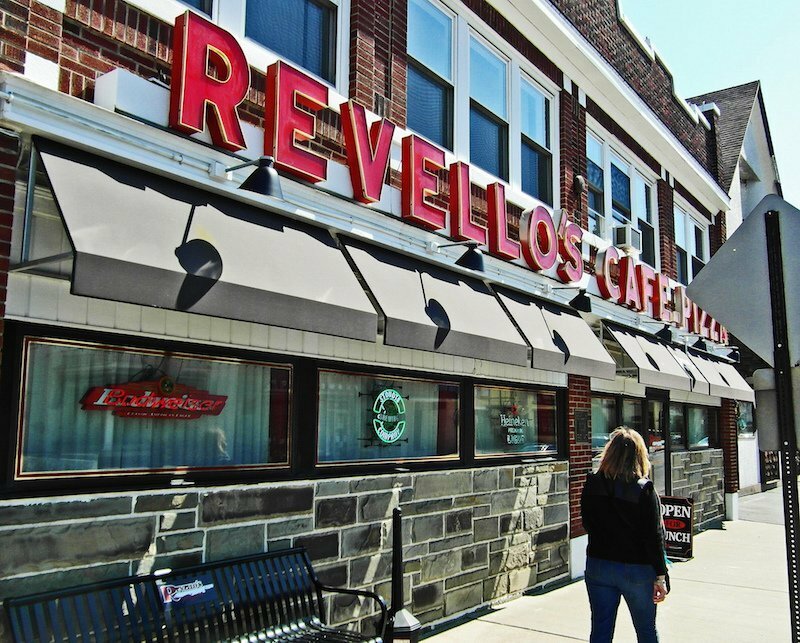 Revello’s was once a mainstay of Old Forge pizza, but we were disappointed. The crust tasted like a toasted version of Wonder Bread and the cheese seemed to be 100% American. It reminded us of snacks we made in the toaster oven as teenagers. We moved on to Mary Lou’s, tucked into a residential in a nondescript tan stucco building a few blocks off Main Street. As soon as we got out of the car and breathed in the garlic-scented aromas, we knew we were onto something. Mary Lou, a sweet grandmother of eight, ably assisted by grandson Joe, was certainly the cutest of the bakers we met. Her pizza education started early in life when her mother taught her the family recipes. A steady stream of customers picking up pre-ordered trays was a testament to her pizza’s popularity. The crispy crust is lighter than the others; the sauce, the best of the day, a perfect blend of onions and sweet tomato. We were pretty full at this point, but as we were driving out of town we made one last stop at Elio G’s to watch Elio and Tom work through the dinner rush. 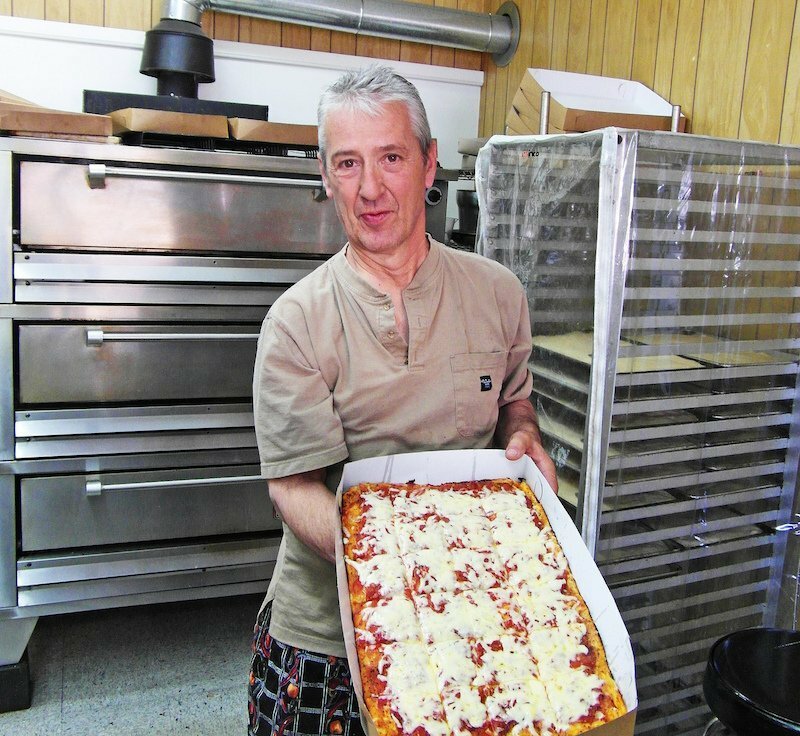 For Old Forge pizza historians, Elio’s is a must-see destination. 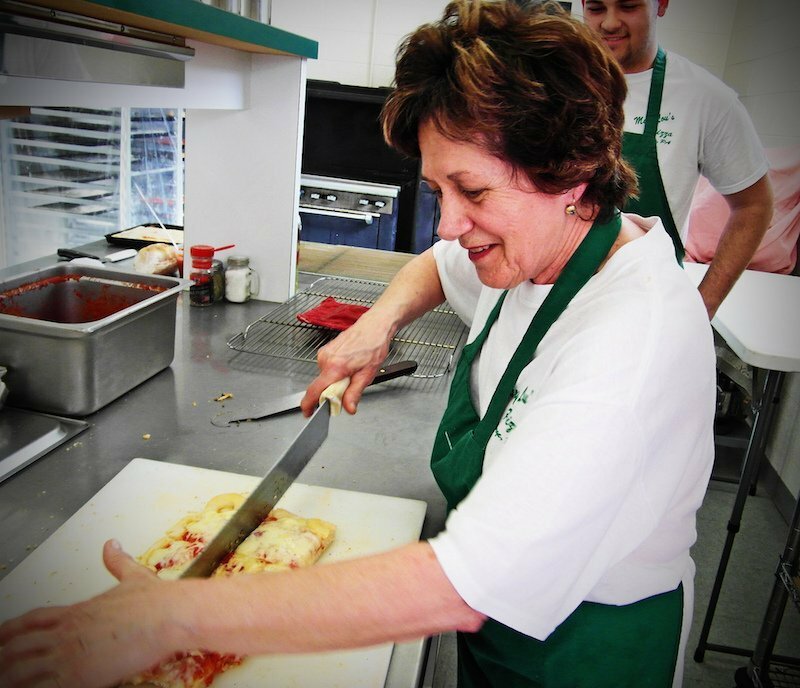 Elio mentioned that his grandmother, Nonni Ghigiarelli, invented Old Forge-style pizza in 1926. She made it for card players at the bar that she and her husband owned. It was an instant hit. Elios white pizza is a blend of cheese and freshly cooked spinach topped with an intense blend of herbs; we tasted black pepper, rosemary, salt and maybe oregano. 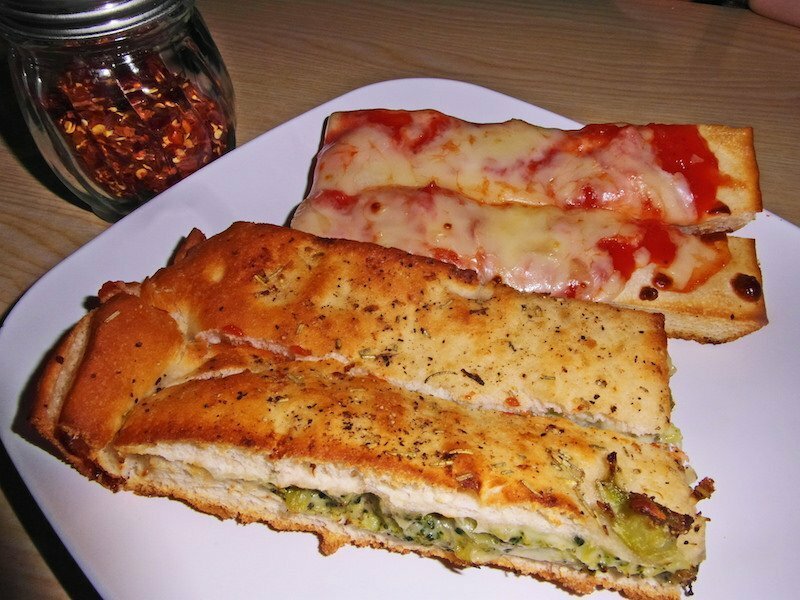 The herbs sprinkled on top made it taste like stuffed focaccia. Speaking of stuffed, we were pretty stuffed ourselves at this point and had to call it a day. 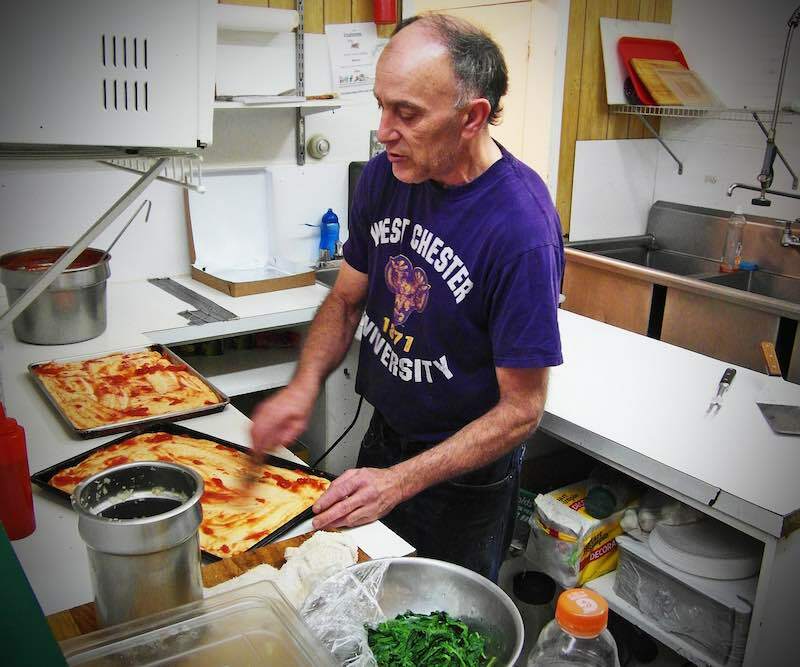 In Old Forge, pizza is a comfort food to celebrate both life and to mark its passing. At Elio G’s, a woman who looked remarkably like Paula Deen, stopped in to pick up five trays for a surprise 40th birthday party for her daughter. At times like these, those who grew up in Old Forge gather around a tray of their wonderfully idiosyncratic pizza to provide support for each other. I recommend visiting Old Forge to witness a true slice, no, make that cut, of Americana. You might be interested in our pizza tasting on six continents to find the best pizza in the world. Here are even more reviews of Old Forge pizza on Yelp.